I thought it was a bust, but the boon just hadn’t happened yet. 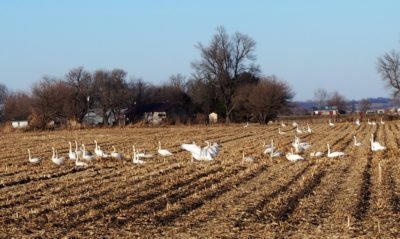 We wanted 100,000 snow geese, but just saw a handful of eagles, and 100 swans, still beautiful and magnificent, but after years of considering the long drive to the Loess Bluffs National Wildlife Refuge to catch the snow geese in migration, I was a little disappointed. Where were the geese? Somewhere for sure, but not where we were. Until they were. Nearing an oxbow to cross the Missouri river into Nebraska, then turn left and go south back to Kansas, right near a small RV neighborhood, largely deserted, a cloud of birds spun up and around, white in the sunlight and black in the shadows. We stopped the car, rolled down the windows and heard the multiplied low barking song of 100,000 or so snow geese. With minutes, we rushed to the end of the oxbow, iPhone in my hands, and camera in Ken’s, as we took videos and photos, and laughed ourselves into crying about how gorgeous and amazing this spinning cloud of birds was. Eventually, the birds settled back on the water, and we headed back to the car to drive around to a closer view of the birds on the other side of a railroad bridge. Once there, we stood on the deck of a small dock and watched them, an island of snow geese un-forming and re-forming its edges into two long strips, joined bird to bird in the middle. 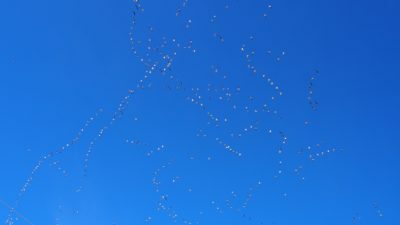 As we got into the car and checked our photos for a few minutes, even with the windows closed, the noise of the snow geese roared to life again. A train was crossing the bridge, and the birds circled up and around again. I ran to the shore, stopping every so often to take a photo, then at the edge of the water, a video of their song and spin. It happened by choosing the longer way home on blue highways instead of the fast-food-edged highways that would speedily deliver us back. It happened by chance and luck. It happened because one of us looked the right direction at the right moment. Then again, it was happening continuously, sometimes over a million snow geese converging and hanging out in this area at once in early December when the weather, water levels, and wind were right. Both of us, after two weeks of enduring some crazy virus that wiped us out and sent us through half a dozen boxes of tissues and a whole lot of cold medicine and Netflix, had decided to simply go while the weather of this area and our health was clear enough. 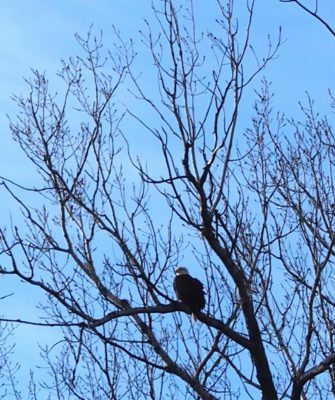 Although I’m still a little under the weather of the virus, I’m a lot over the moon and back from seeing, hearing, and being in the presence of such vibrant and ancient grace. If this writing speaks to you, get a copy of Caryn’s new book, Everyday Magic: Fieldnotes on the Mundane and Miraculous, based on over 10 years of this blog. Details here.